NCIL members, your advocacy on the Convention on the Rights of Persons with Disabilities (CRPD) has been very effective. Your outreach through calls, emails, and social media prompted the Senate Foreign Relations Committee to vote the CRPD out of committee on the 22nd Anniversary of the ADA! When NCIL members gathered in Washington, DC for the 2012 Annual Conference, talking with your Senators during Hill Visits provided important advocacy by educating lawmakers on the importance of the CRPD to the disability community. Congress is on recess until November 13, 2012, at which point the “lame duck” session will begin. We are close to achieving our goal of Ratification of the CRPD. The disability advocacy community is coming together to be a part of a Three Phase Campaign that started Monday, October 22 and runs through the end of the year! 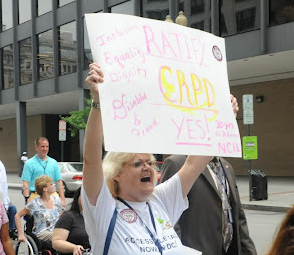 NCIL joins over 100 other disability organizations in this campaign to get the CRPD Ratified in the 112th Congress. We have been told that Senators need to hear that the disability community supports CRPD and wants to see ratification. NCIL will be leading the campaign on Tuesday, November 14th and Wednesday, December 5th! Through a concentrated effort, we hope to achieve the goal of contacting all 100 Senators on those days. Tweet (using the hashtag #CRPD) or Facebook. *Please send pictures of you and your community with signs supporting the CRPD. The message: I am a person with a disability [or an advocate] and I support the CRPD. I want you to ratify the CRPD in the lame duck session of Congress. We need you to activate your networks. Contact your Senators and then get your family, friends, and community allies to reach out to their contacts as well. With you help, we can do this!